The new album from Bonny Doon, Longwave, dropping on Woodsist Records on Friday, is the sort of release that sneaks up and surprises you. Largely down-tempo indie, the tunes here are uniformly good, and likely to appeal to fans of acts as disparate as Big Star and Built To Spill. "A Lotta Things" works up the sort of slacker charm that Malkmus and his kinsmen in Pavement routinely conjured, while the more languid "Take Me Away" recalls The Jayhawks, of all things, or even The Pernice Brothers. 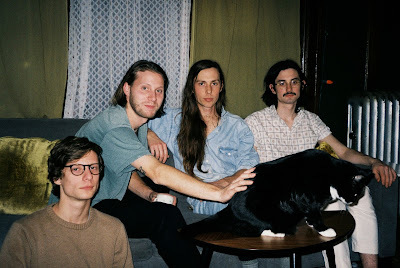 If the members of Bonny Doon seem to be drawing from a bunch of inspiration points, at least there's a uniformity on Longwave that suggests that the band have learned to internalize all this in order to produce uniformly-great music. Elsewhere, "Saved" nods in the direction of Exile-era Stones, while the lovely "Saw A Light" blends a bit of neo-folk up with something approaching the sort of thing that usually gets compared by critics to the music of Gram Parsons. Bonny Doon manage to make lots and lots of this work, and a reader shouldn't infer from my comparison-points that Longwave is simply derivative alt-rock, as it's not. At their very best, like on the supple title track, Bonny Doon make music that makes me think of some of the stuff that Beulah did towards the end of their career. And what that means in 2018, is that Bonny Doon have a knack for doing this sort of couldn't care less-ness with ease, the melodies easy to sink into, and the hooks gentle things unlikely to rock too many boats. And that's sort of the genius of Longwave as a record, I think. Longwave is out on Friday via Woodsist Records. More details on Bonny Doon via the band's official Facebook page.